Fencing is a competitive sport with nationally-mandated rules about how to fence, the proper equipment, and the field of play. A participant only ever faces one opponent at a time, called a "bout". There are team competitions but even those involve bouts between two individuals at a time, and the total points scored by members of each team determine the winning team. The object of a bout is to score the most points via "touches", or valid hits on the opponent. A bout ends when one fencer reaches the score limit or time expires: 5 points within 3 minutes, or 15 points within 9 minutes (depending on the type of bout). The proper protective gear includes a multi-layered uniform to protect the body and a mask to protect the head (see our Equipment page for details). The tip of a fencing weapon is the second fastest moving object in sport (the first being a bullet) so it is very important to always wear the proper equipment! The field of play, called a "strip", is 14 meters long and 2 meters wide. Fencers are supposed to remain within the confines of the strip; failing to do can result in a penalty. Another way to incur penalties is through improper actions during a bout (see the Penalties section below). There are three weapons to choose from: foil, epee, and sabre. While some fencers learn how to use more than one, many choose to focus on a single weapon. Fencers at competitions are always grouped together based upon the weapon, so you never have foil vs. epee, etc. At regional and national competitions fencers are further separted by gender, age, and classification, but the smaller local tournaments are usually coed and often open to anyone at least 13 years old. Separate tournaments are sometimes held for fencers between 8 and 13 years old. Below is a breakdown of the three weapons and what makes each one unique. The concept of armed combat is prehistoric, but some of the earliest historical accounts of duels between two people harken back to antiquity (i.e. ancient Greece and the Roman empire). Medieval dueling gave rise to fencing schools and sword warfare evolved into a martial art. Fencing schools became more popular during the Renaissance, and modern fencing styles began to take shape in the 18th century. Dueling went out of use in the early 20th century due to the rise in popularity of firearms, but fencing continued on as a sport. It is one of only four sports featured at every one of the modern Olympic games which began in 1896 (athletics, swimming, and gymnastics are the other three), and it was also a part of the original Olympic games of ancient Greece. Valid target area in foil. The foil came into existence as the weapon used for non-lethal training at fencing schools, and thus it is still used by the majority of fencing groups as the training weapon for beginners. It is a stabbing weapon, meaning you are only supposed to hit your opponent with the tip of the blade. For a hit to be counted as a valid touch it must land on the torso; the arms, legs, and head do not count. The valid target includes the front, back, and sides of the torso (the groin counts, however on the sides and back the target ends at the waist). This limited target area came about from late Renaissance fencing masters instructing their students to only aim for vital parts of the body, while attacking the head was considered unsporting. Foil also has a special set of rules, called "Right of way", that are used to determine which fencer scores a point based upon the actions taken by both fencers. In essence, "right of way" is synonymous with "right to score". The fencer that attacks first is considered to have the right of way and will score a point upon hitting the opponent, unless that opponent can gain the right of way by making the attack fail. If both fencers hit each other only one of them can score a point, and sometimes neither is awarded anything if they both attacked at the same time. Valid target area in epee. The epee (pronounced "EPP-pay", meaning "sword" in French) descends from the rapier, one of the more popular swords used in duels. It is a stabbing weapon, like foil, meaning you are only supposed to hit your opponent with the tip of the blade. Unlike foil, in epee the entire body counts as a valid target (arms, legs, head, and torso). This makes epee bouts more like an actual duel, where often the first fencer to draw blood from any part of the body was declared the winner. Another difference from foil that makes epee more like a duel is the lack of "Right of way". Whichever fencer hits first usually scores the point, and if both fencers hit each other at the same time then both score a point (this is called a "double-touch"). 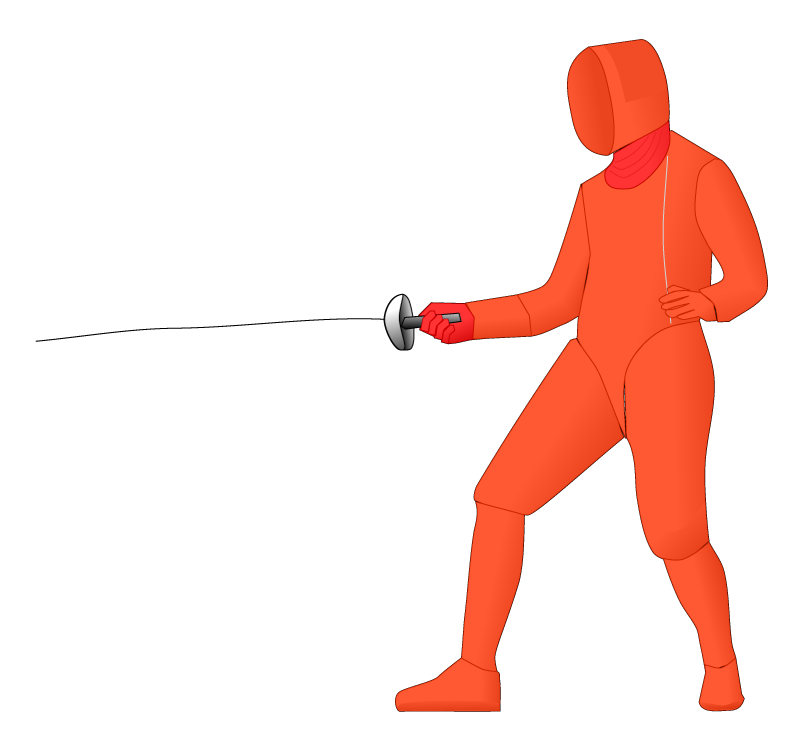 The full body target and possibility of a double-touch often results in slower action in an epee bout, since both fencers must take great care with their attacks. Also, the lack of complex scoring rules makes epee the easiest of the three weapons for an audience to follow. Valid target area in sabre. The sabre descends from the sword used by cavalry. Unlike foil or epee, sabre is a cutting weapon, meaning the opponent can be hit with any part of the blade. 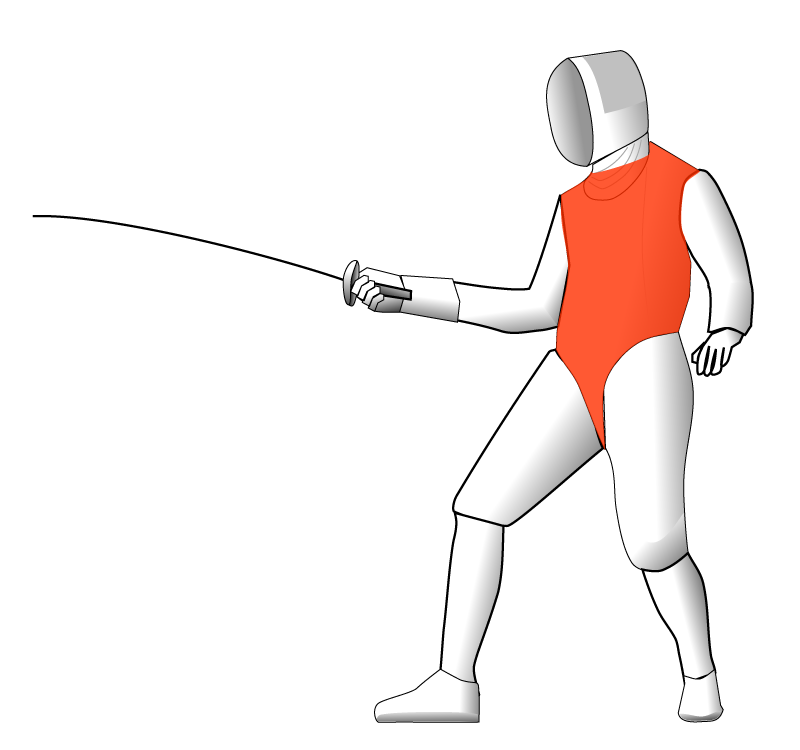 The valid target for sabre is the front, back, and sides of the upper body from the waist up, including arms and head (but not the hands). This limited target area came about from the notion that it is contrary to the rules of chivalry to attack an opponent's horse. Sabre also has the rules of "Right of way", like foil, and thus fencers cannot both score a point at the same time. Sabre typically has the fastest action during bouts, making it the polar opposite of epee. The simplest penalties are a result of one fencer leaving the confines of the strip. 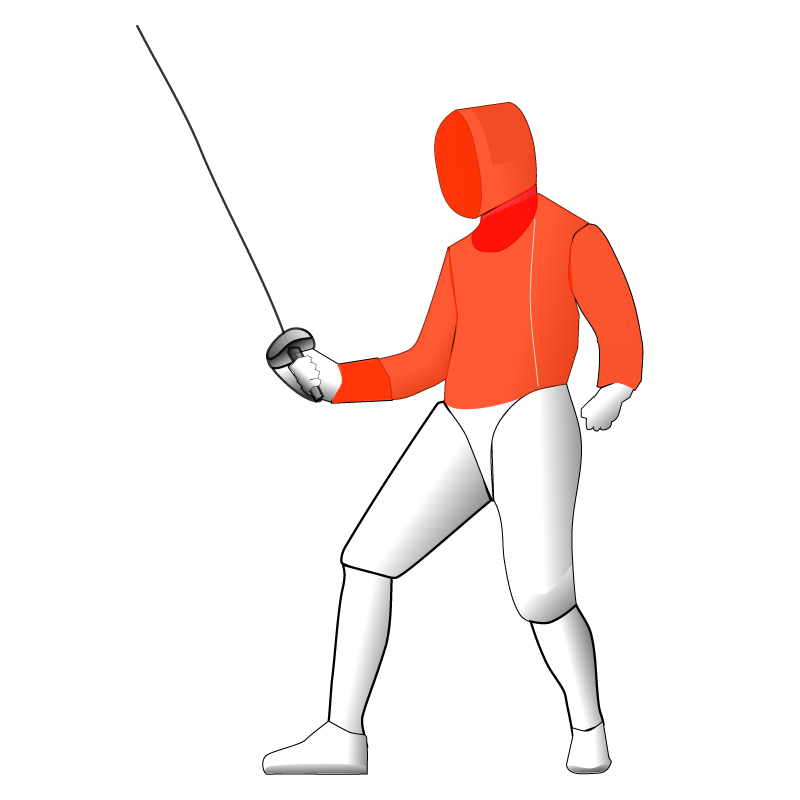 If the fencer steps off the side of the strip with one or both feet then the action stops and he or she must lose a meter of ground on the strip. If the fencer steps off the back end of the strip with both feet then the opponent is awarded a point. All other penalties are three different colored cards that are given for specific improper actions. A yellow card is a warning and is given for minor infractions (such as turning away from your opponent). A red card is given for each additional minor infraction after receiving a yellow card, or for major infractions, and results in your opponent receiving a point. Yellow and red cards only apply to the bout in which they were acquired, so the cards do not carry over to the next bout. A black card is only given for the most severe infractions and results in immediate elimination from the competition. PDF files of the USFA rules and complete Penalty Chart can been found here on the USFA website's rules page. Again, fencing is a competitive sport. Tournaments are hosted by the USFA all over the country throughout the year. Most tournaments take place on weekends, but the large national tournaments are Friday through Monday. One of the benefits of official USFA tournaments is they are the only way a fencer can earn a weapon classification. These classifications serve as an indicator of a fencer's skill level with a particular weapon, similar to the colored belts in judo and karate (although unlike the belts, fencers do not have any part of their uniform that displays their classification). Fencing classifications are letters, with E being the lowest and A being the highest. Also, these classifications only apply to the weapon that was fenced when earned. In order to attend a tournament a fencer must be qualified in terms of age and classification. The fencer must also have all of the necessary equipment. The full protective uniform consists of a jacket, plastron, knickers, knee-length socks, glove, shoes, and mask (and a breast protector for female fencers). A tournament also requires equipment that can be used with electric scoring apparatus; the equipment necessary depends on the weapon. Foil and sabre require a fencer to wear an extra outer vest/jacket made of a metallic mesh, as well as masks that are partially (foil) or completely (sabre) metal. For all three weapons a competitor must have a minimum of two electric weapons and two body cords at the beginning of every bout. Failure to present two weapons and body cords at the beginning of the bout results in a yellow card. The most important part of any tournament is to have fun and enjoy fencing!